Home Blog Keeping up with technology advancement. The 5G concept. This entry was posted in 5G, IoT, Mobile Development, MWC19, Technology on March 15, 2019 . 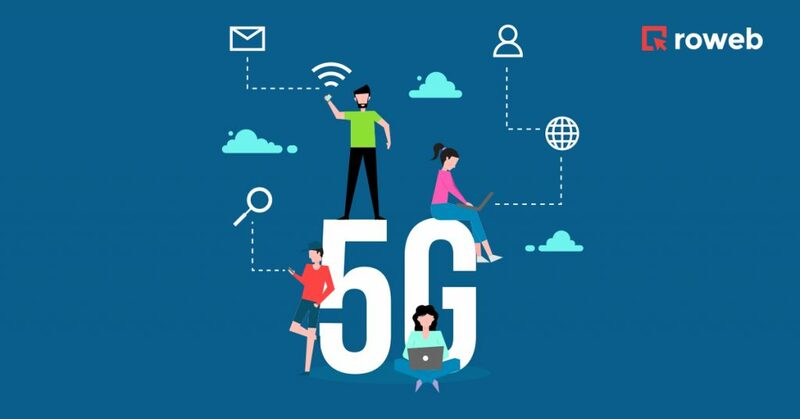 Now with the new trend of IoT, 5G emerged to sustain the rising tide of AI supported things. Imagine a world where you won’t be late to work because of traffic, where almost anything will be automated. A lot of IoT projects are already being implemented such as our own “Home Automation” that focuses on maintaining your indoor temperature constant based on current indoor and outdoor temperature. With 5G we will be able to do much more. How does 5G technology work and what are its advantages? To visualize this, you need to understand where 5G is on the electromagnetic spectrum chart below. Microwaves, TV’s, and what the mobile companies use now, use the large waves. The radio wave passes through a solid object with more difficulty as the frequency increases. X-ray machines and UV lights use this type of radio wave. The 5G frequency is located in the middle of them, and it’s called a millimeter wave. So, in short, it’s faster than frequencies that service providers use, but it doesn’t travel as far. The three major features 5G offers from a technical point of view are speed, density, and latency. The download speed 5G offers, can allow up to 1 GB/s on a mobile device. This is more than we usually have at home. So picture yourself on a vacation trip and using augmented reality you could wave your phone and download videos with past battles, information of the monuments and nearby restaurants, in a matter of seconds. The density will allow more users to utilize devices in a given space without losing signal and download speed like you often see at concerts. With this service, apps that are intended to work in hyper populated areas will offer a better client satisfaction rate. The latency will be a thing of the past as 5G will offer a lag time of 1 millisecond. Say goodbye to the time when you would wait for your page to load. This will allow apps such as games to run uninterrupted, removing the ever stressful in-game lag. How will mobile be affected by 5G? Mobile will never be the same again after 5G is implemented. Apps will improve, games will embrace the augmented reality concept even more, and tracking software will be more efficient. So basically it’s going to reshape how we view everything around us. Luckily Roweb will always be up-to-date with the leaps in technology, and we will always be willing to implement your business ideas with trained and qualified experts. We stand at a historical moment where digital has evolved beyond its past capabilities. It’s entering a new era of which we’ve only seen in Sci-Fi movies. We will be able to implement AI more efficiently into everyday objects such as cars, household items and basically anything that’s around us. Countries like Korea, Japan, and China are already getting ready to make the 5G technology leap by the end of 2020. Most of the subjects at the Mobile World Congress (MWC19) where all about “Intelligent Connectivity” and, how the 5G network is about to change everything. Roweb went to MWC19 to learn more and further increase our technical expertise so we can be more efficient when implementing your future mobile apps and IoT solutions with 5G technology.